The countdown begins! Next week, PSYCHO LAS VEGASAlice Cooper, Blue Öyster Cult, Converge, Down, Drive Like Jehu, High On Fire, Sleep, Pentagram, Yob, Mars Red Sky, exclusive 2016 US performances from both Electric Wizard and Candlemass, and many more. Official day-to-day set times are now posted on the flyer below and at THIS LOCATION. Due to popular demand, single-day PSYCHO LAS VEGAS passes are now available. 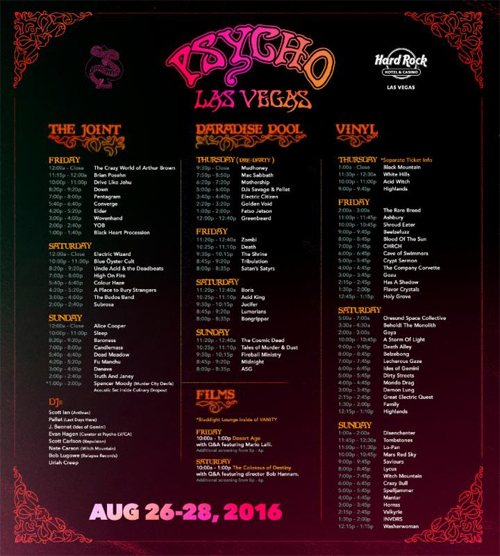 As always, three-day PSYCHO LAS VEGAS passes include Free Admission to Psycho Pool pre-party on Thursday, August 25th at the Paradise Pool Stage. For more info on all pass options, visit Event Brite HERE. Additionally, fans now have a chance to win a private meet and greet with Alice Cooper! To enter, simply share the image found HERE on Instagram by tagging a psycho friend and #vivapsychoLV. A winner will be announced on August 22nd at 10:00pm PST. Among the many features of PSYCHO LAS VEGAS beyond great music is the Black Light Lounge which will highlight PSYCHO LAS VEGAS' artists in residence, Arik Roper, Dirty Donny Gillies, Skinner, as well as main festival artist David D'Andrea. Attendees will be able to purchase new, limited edition works from all of them and get them autographed. In addition to the interactive backlight chamber, PSYCHO LAS VEGAS includes film screenings, DJ sets hosted by Scott Ian (ANTHRAX), Sean "Pellet" Pelletier (LAST DAYS HERE), J. Bennet (IDES OF GEMINI), Evan Hagen (Psycho LV/CA Curator), Scott Carlson (REPULSION), Bob Lugowe (Relapse Records), and Nate Carson (WITCH MOUNTAIN) as well as the Psycho Pool Party kick off at the Paradise Pool Stage August 25th featuring MUDHONEY, FATSO JETSON, MOTHERSHIP, and more as well as an indoor pre party on the Vinyl stage featuring BLACK MOUNTAIN, WHITE HILLS, and ACID WITCH. Convenient lodging is still available at Hard Rock Hotel & Casino Las Vegas located on 4455 Paradise Road, Las Vegas. Use the code. Book today at THIS LOCATION.